Blogger Tips: Three Ways To Get Your Blog Out There More! I've been blogging for just over four years now, and to say I know everything about blogging would be the understatement of the blogging world! I'm sure many bloggers will agree with me when I say there is always something new to learn, even the most established bloggers will face new platforms and ways of blogging throughout their blogging years! I've seen many bloggers come and go, some because they started a blog thinking it would be as easy as peeling a potato, and some because they've given up blogging after many years to make way for new life adventures, the first usually being the reason why I see so many leave the scene as quickly as they've entered it. I've lost count of the amount of times I've been messaged by 'real' life friends, or received emails from upcoming and new bloggers wanting to know how to get themselves and their blog out there more, and whilst I always point them in the direction of a very old blog post I done (which I really should update), for this post, I thought about the bloggers who aren't new, and who struggle to find new readership! So here are my three top tips to find new readers and visitors, whilst my hits haven't shot up by the millions just yet, I have noticed a fairly decent raise in hits by sticking to these tactics! Business cards? What are they? Read paragraph two for old style promotions, but for now, lets concentrate on the fast moving world we live in, or more so live on - the internet. Promote your blog through as many platforms as you can, my favourites are LinkedIn, Facebook, Twitter and Instagram, there's also Snapchat and Pinterest which I just can't get on with, but of which I know other bloggers love! One of my favourite ways to get myself out there more via social media is to join in with Twitter parties and chats with like minded individuals! Another way to promote yourself via the web is by guest posting for other bloggers! Introducing yourself to readers and visitors of other bloggers isn't a sure way to bring in new followers, but it's more than likely to bring in new hits, and maybe just maybe that follow button will get pressed! Read and engage with other bloggers by leaving comments, but try not to spam and use the URL boxes to leave your link address. One of my favourite places to leave my link for people to potentially visit is parenting forums, if someone ask for advice on a subject that I've covered on the blog, I'll leave a link to it and sure enough the hits soon roll in, and for me personally this has been a good way to help my readership build! Step Two: Promote Your Blog Via The Old Fashioned Way. I started the paragraph above talking/joking about business cards, but I swear by business cards and always make sure I carry at least 20 with me, or more if I know I'm going to a blogging conference/big event. I often get talking to lots of people, from parents to grandparents, from builders to beauticians, I talk lots and I must admit the blog is always a good topic burner! It gets people curious and instead of explaining everything, I give them a business card (or a button - more below!) and tell them to take a look themselves! A button I hear you ask? 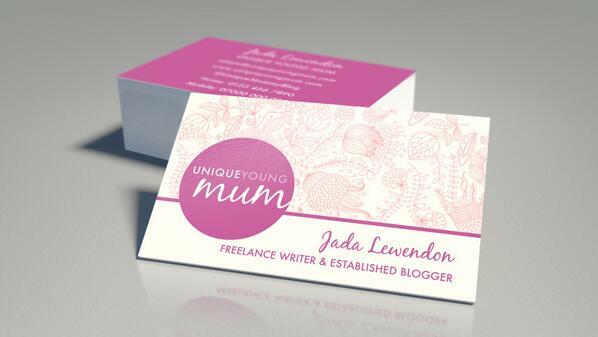 Not just any button of course, but personalised buttons designed with the Unique Young Mum logo and URL. Whilst the idea never stood out to me before, I once got handed a button at a festival and unlike business cards that tend to get thrown in my bag, I put the button in my purse and actually visited the website of the company in question! I know of a few american bloggers who leave buttons of theirs everywhere, from the underground to nightclub tables, and whilst I'm not that brave, I can see the idea behind it! Step Three: Promote Your Blog Via Bigger Publishers! I feel like a bit of a cheat mentioning this as my third and final step, as it's not a step I've been brave enough to step in myself due to a lack of confidence, but if you've got the confidence, then I say go for it! Look into writing for magazines, newspapers and other online establishments! I know a few bloggers who write for the Huffington Post and who's following has dramatically improved! Alternatively you can sell your stories to magazines, and also get in with the press! Constance Hall is constantly being mentioned in a newspaper that I read regularly, not because I like/prefer the newspaper, but because it's full of articles and free to read! I know a few stories I could sell to magazines, but its just my confidence that stops me from doing so, it's something I'd love to work on building, but in the meantime it's not a priority! There we have it, my three tips on ways to get your blog out there more! I'm sure there are thousands more, but I find that two of these three work for me, and three of these three work for lots of other bloggers! If you have any more tips please do leave them in a comment below! What to Do When You Hit Rock Bottom Financially. Pregnancy and Incontinence, You're Not Alone. Five Ways To Make Your Grandparents Life Easier. Tackling The Stress and Bad Habits. 8 Signs You're Dating the Wrong Person. War With The Pervert Next Door.